Tarangire National Park is one of the best wildlife parks in Northern Tanzania safari circuit. An hour and a half drive from the safari base town of Arusha, Tarangire National Park is third largest national park in Tanzania. This National park measures some 2850 square kilometers and is highlighted with Baobab trees and the largest herds of Elephants during the dry months. The Tarangire River is the meeting point for all the animals during the dry months and draws together the unbelievably large herd of elephants, as well as other larger mammals like zebras, giraffes, buffaloes, smaller antelopes like gazelles, elands, beisa Oryx as well as the predators. During the rainy months of April and May some of the herds of elephants migrate out of the park to Simanjiro plains the Masai steppe due to water logging in the park. Other animals like wildebeests also migrate to the Masai steppe for rooting and foaling where there are mineral rich pastures good for the mothers and the newborns. However there are resident animals that remain in the national park all the year round and this ensures the park can be toured anytime of the year. Perhaps the most interesting time to visit this national park is during the months of September through October when the herds of elephants migrate into the Tarangire making up to 300 strong families of jumbos, cows, bulls and calves moving together. Other animals that can be viewed in the national park include impalas, hyenas, lions, cheetahs, hyenas and the rare leopards. The evergreen marshes are a perfect habitat for birds. More than 550 species of birds have been spotted in the park, including lover birds, rofous-tailed weavers, and ashy starlings among many more. Around the Tarangire National park walking safaris are can be arranged, and visitors accompanied by the guide and an armed ranger or Masai warrior, can experience the African wilderness by foot, apart from the usual game drives. Just close to the park along the Arusha – Dodoma highway visitors can tour the rock paintings at Kolo and also visits to the animal skin wearing Barabaig tribes men villages along the Dodoma Road. 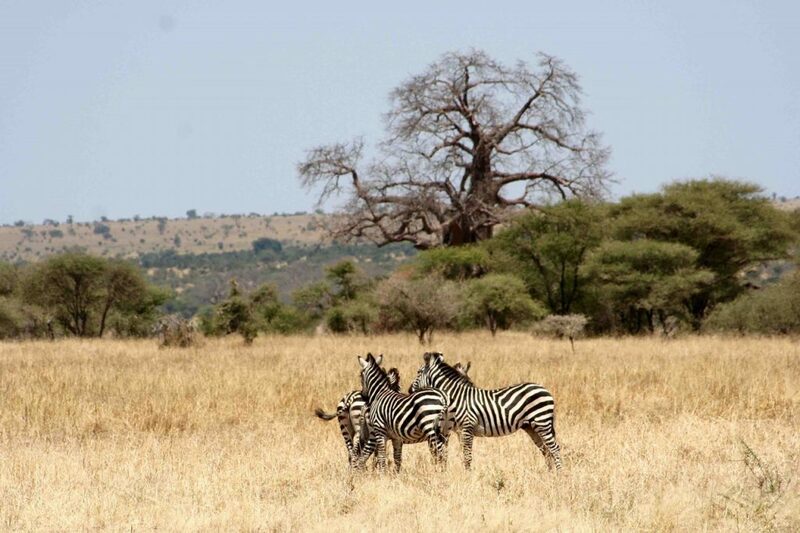 Tarangire National park can be included in both short and long wildlife safaris to Northern Tanzania. Now we offer; Hot Air Balloon Safaris in Tarangire National Park the same way we offer Serengeti Balloon Safaris in the Serengeti National Park. Please let us know if you wish us to arrange a visit to Tarangire National Park and its environs and we shall include that in your itinerary.